Google news, Digg, yahoo news and many other news sites are available to share news in real time, may that be related to any topic from Science and technology to health and politics. 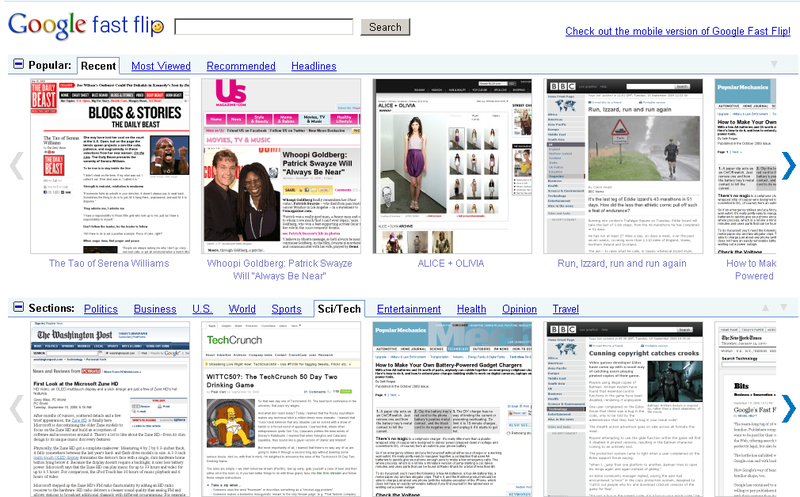 But Google has come up with a better idea of displaying news articles – Google Fast Flip. The topics come by default initially but if you want it to be customized and want to have the categories of your wish, you can do that too and make it a more personal type of online magazine supported by Google. Stories can be recommended to Google Fast Flip and also there is a voting system with the help of “Like” button below each article which can make them understand which kind of stories are liked by the readers and which can be removed. You hit the Like button and your contacts will know about it in Fast Flip when they are browsing the stories, so thats an indirect recommendation of the story to them. This is still a labs version and available only in English language, and the concept is very cool. The site is available in mobile version too for those who browse through their iPhone or Android based phones. Check out Google Fast Flip at the Google Labs Site. the concept is very cool, but can you tell me when it will be released from the lab.